Sunday evening I was in the mood for a snack or dessert, but I wasn’t sure what, and I didn’t want to put a lot of effort into anything. (This was about six hours after my allergy crash of 2012.) I got out my Pamela’s Baking & Pancake Mix and checked out some of recipes on the package. 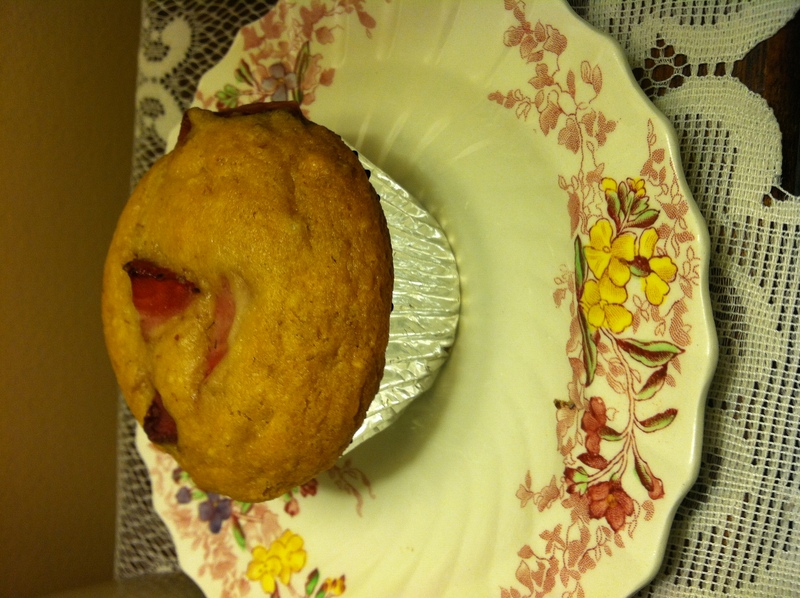 She includes several recipes, but I decided to go with the muffins and put strawberries in them. Not only were these really fast and easy; they’re actually quite good. I used agave instead of honey or sugar, and I doubled the batch to make twelve instead of six. I’m excited to learn how to do more official gluten-free baking, but I have to say, I’ll probably keep Pamela’s mix around for last-minute fixes. Warm muffins with butter and a cup of tea were just what I needed.